Guitar Rig's ease of use and versatility are most appealing, but while it sounds good, connoisseurs of tone may find it lacking. Versatile Control Room module. Punchy Jump amp model. Simpler controller assignment method. Handy Master FX section. Great presets. There are better options available, as far as tone goes. Underwhelming update after two years. Guitar amp modelling has come a long way since Native Instruments released Guitar Rig 3 in 2007. IK Multimedia in particular has impressed, with its AmpliTube Fender setting new benchmarks in authenticity, proving just how far software can go towards recreating the indescribable vibrancy and responsiveness of a genuine valve amplifier. This level of authenticity, sadly, is something that's been slightly lacking in Native Instruments' offering. Guitar Rig's trump card, though, has always been its flexibility, with the previous versions offering a far broader range of tonal options than its contemporaries. True to expectations, v4 is packed with new features - but have NI made a concerted effort to improve its tone? There are a number of bundles available, the top-of-the-range one being Guitar Rig Kontrol (£351), which includes the Guitar Rig 4 Pro software along with the Rig Kontrol hardware (a foot controller and audio interface all in one). While we also tested GR4 Pro with a Rig Kontrol unit, the hardware hasn't changed since we reviewed GR3, so our review here is essentially of the software-only edition, as reflected in the price quoted. Guitar Rig 4 Pro's headline act is its trio of new amp models: Hot Plex, Cool Plex and Jump. The Hot and Cool Plex are two variations on the classic Marshall Plexi-type sound (still on offer as the Plex model). Hot Plex is a slightly higher gain amp, which also seems richer in harmonics compared to the original Plex. Setting the volume controls low offers just-breaking-up tones that sound far hotter and more 'loaded' than the standard Plex, whereas cranking the gain yields that extreme, vintage tube sag-style drive favoured by players like Jack White. Cool Plex goes the other way, offering crystal clean sounds, but with more saturation. The tones you can wring out of the model really do sparkle compared to those of its antecedent, but still retain the classic Plexi sound, being thick and full rather than harsh or twangy. "Guitar Rig 4 Pro's headline act is its trio of new amp models: Hot Plex, Cool Plex and Jump." Finally, we come to Jump - our favourite of the new models. Jump is a lower gain version of the Lead 800 (the Lead 800, of course, being modelled on Marshall's rock mainstay JCM800), which really comes into its own for clean tones. In fact, Jump is the first of GR's models that can really deliver the kind of chest-thumping punch and body of a clean valve amp - a quality sadly lacking in the Twang Reverb model (based on Fender's Twin Reverb combo that, in the flesh, is one of the hardest-hitting amps you'll ever hear). In terms of new effects, we have four new modules. Grain Delay is a granular processor that offers transpose and reverse options for your repeats - a fantastic idea, but in practice, we found that the more overtly grainy sounds just sounded too cold and digital alongside an electric guitar. Furthermore, while the more psychedelic, octave-shift reversed delay-type sounds are fun, they still pale in comparison to those of, say, Waves GTR3's LayD pitched delay effect, which are far richer and more expansive. The second new effect is Iceverb - essentially a resonant reverb that creates reflections within a filtered frequency range. It's a really unique sound - glassy and brilliant with the Colour set high, booming and vocal when it's low. Octaverb, on the other hand, is a more standard reverb that features algorithms for eight different room types. The sound is richer and more complex than that of the studio reverb plug-in, and it works wonders on drums, too. There's also Twin Delay, a simple two-channel affair, with basic mix, feedback and rate controls. Rounding off the effects improvements is the new Master FX feature that enables you to add a global effects chain - ideal for bolting a master reverb or EQ onto your live virtual rig. 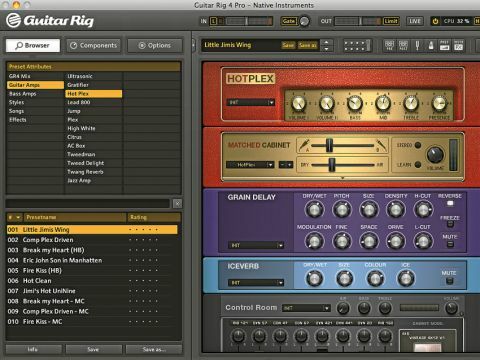 Possibly the most interesting new feature of Guitar Rig 4 Pro is the Control Room module. This is an all-in-one cabinet miking solution featuring five virtual cabinets, each miked up using up to eight classic microphone models spanning ribbon, dynamic and condenser types. You can control the volume and panning of each microphone separately, sculpting the sound you want by mixing the multiple mic 'channels' together. All of the mics are, of course, perfectly in phase, and you can even solo or mute each one individually. "Control Room is particularly handy when it comes to mixing and recording, as its flexibility means you can easily get your guitar to 'sit' exactly where you want it." You'll probably be surprised by how drastically you can change the tone of any one cab here, and it's actually really easy to hone your sound. For example, we found it useful to select each mic channel in turn, solo it, take note of its aural characteristics, then set its place in the 'mix' accordingly. Control Room is particularly handy when it comes to mixing and recording, as its flexibility means you can easily get your guitar to 'sit' exactly where you want it. Control Room also features a master Air parameter (for adding room sound), just like Guitar Rig's other cab sims. It's a welcome addition, although we'd like to see a separate Air control for each mic channel to give an even greater degree of tweakability. Elsewhere in GR4 Pro, there are various little tweaks. Among them, we have true stereo processing, a simple click-and-drag method of assigning footpedal controls (NI's Kontrol interface is unchanged in this update) and modulation sources, plus a reworked preset browser similar to NI's Kore Sound Browser. Speaking of presets, there are a generous 250 on offer here, all of a far higher calibre than those of the previous version. The amp and cab models have apparently been reworked, too, and their tone has indeed genuinely improved across the board. However, several amps still sound too woolly and it's only really the three new amps that could even begin to rival the sound of a real amplifier. It's this issue of tone that's likely to be the sticking point for many guitarists and producers. NI has had nearly two years to work on Guitar Rig 4 Pro, and while it has certainly come a long way in terms of sound, stellar offerings from the competition, such as IK Multimedia's AmpliTube Fender and Waves' GTR3, have come even further. For flexibility, though, Guitar Rig is still king, and version 4 is undoubtedly the easiest to use and the most powerful iteration yet.